It is a popular dessert in our family, always eaten with custard. It can be served with fresh vanilla ice-cream or whipped cream. It is an easy dish to make. Juice and rind of 1 lemon. You can use orange instead. 1 1/2-2 cups custard or 1 cup double cream or vanilla ice-cream. It is difficult to quantify these, each person is different in how much they want with their pie. Peel and chop apples into small cubes. Add cinnamon, sugar and lemon/orange juice and rind. Mix well. Put apples in an oven proof pie dish and press firmly, to make the surface as even as possible. Mix flour and butter by rubbing it between your fingers. This can be done in a food processor. The end product should look like fine bread crumbs. If you like a lot of crumble on top of your apples, increase the amount of crumble ingredients to 1 1/2 to 2 times the amounts given here. Spread evenly over the apples. Bake at 170 C/325 F/gas mark 4, for 35-45 minutes. Times vary in different ovens. It should look golden brown and crisp. Serve piping hot, with chilled custard or whipped cream or ice-cream. 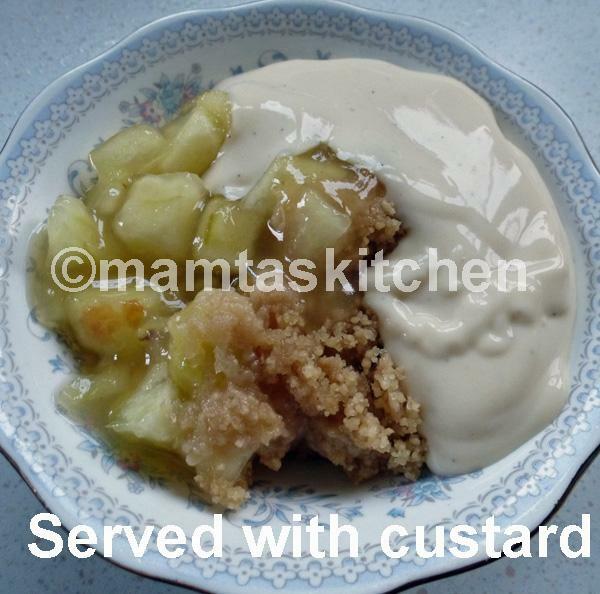 Apple crumble can also be made in small, ramekin pots as individual portions, see last picture see picture. Alternative taste and flavour: Add rind, flesh and juice of an orange or rind and juice of half a lemon to the apples. Or, add a little grated nutmeg or 1/2 tsp. mixed spice or 1/2 tsp. cinnamon powder and brown sugar to the chopped apples. Microwave cook for 4 minutes to soften a little. Lift fruit out into the pie dish. Add a little (about 2 tsp.) corn flour or arrowroot flour to the juice (this will thicken it). Add the juice back into the apples. Cover with crumble topping and cook as before-step 6. You don't necessarily need a food processor to make crumble, just rub flour and butter together until crumbly in texture. Crumble can be made up to step 5 and then frozen.